You can fix the background image for your website, so it doesn't move when you scroll through your site. This can be handy if you want to have a scenery or landscape as a full-screen background. Click Template Settings in the bottom right corner. Click Background in the floating menu that appears. Select or upload an image. Check the box for Don't scroll with page at the bottom of the floating menu. 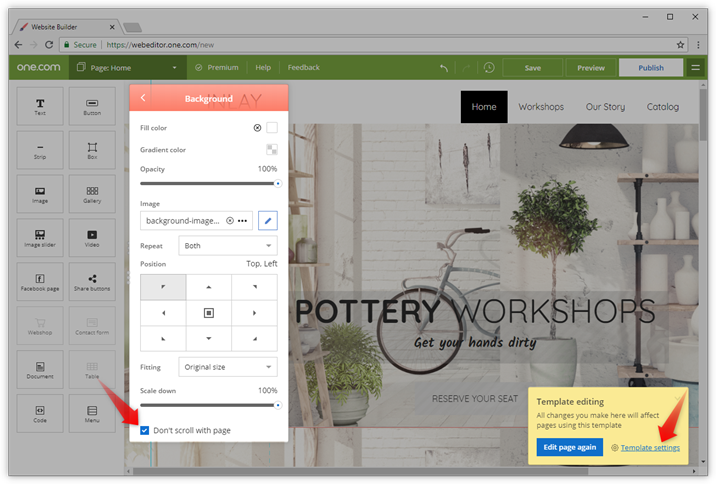 Tip: Change the settings for Repeat and Fitting to adjust how the image is shown on your site.